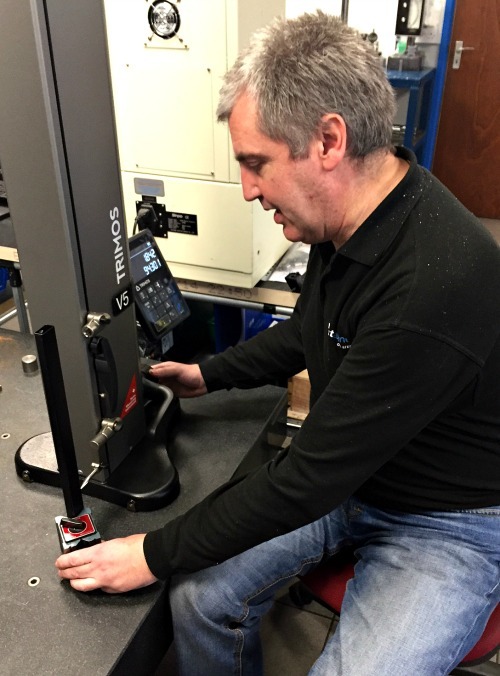 Bowers Group has supplied voestalpine Rotec Ltd with a Trimos V5 Height Gauge to ensure the accurate measurement of machined tubular components for the automotive industry. Based in Hinckley, Leicestershire, voestalpine Rotec Ltd manufactures products ranging from simple bush tubes to complex assembled parts and has extensive knowledge of tube processing and manipulation. Bowers Group supplied voestalpine Rotec Ltd with a Trimos V5 vertical measuring instrument, which can either be manually operated or motor driven. Whist the company have existing Trimos Mini Verticals used solely for measuring height, the Trimos V5 universal height gauge is perfect for lab use and the measurement requirements of the company. In addition, the Trimos V5 can be used with software that transfers the measurement data straight to a computer, and then easily displayed in Microsoft Power Point or Excel, or sent directly to the printer. This can be imported directly into the bespoke software for calculating machine capability, etc. As a Global Organisation, voestalpine Rotec Ltd supplies a variety of global automotive OEMs, Tier One and Tier Two suppliers. As process and materials specialists, the company works closely with customers to develop product solutions that meet high quality standards, and strongly believes in continuous improvement and innovative thinking. Some of the automotive parts that voestalpine Rotec Ltd manufactures include formed press work, welded assemblies, brace works, and suspension brackets. The company manufactures parts for leading off highway vehicles, global automotive companies, and titanium bicycle frames for Brompton bicycles. Due to the complexity of components manufactured at Voestalpine, measurements may be required for a variety of dimensions including; height, diameter, hole centres, pitch, flatness, and squareness. Components are typically manufactured using a laser, with complex dimensions that are notoriously difficult to measure. It is important to maximise the laser for cutting during manufacture and lengthy measurement processes required for each component impact on machine efficiencies. Before the Trimos V5 Height Gauge, operators at voestalpine Rotec Ltd would have to move away from the machines use the linear gauge and shadowgraph instruments then back to their workstations. First off measurements would be taken, and then adjustments would be made to the component as needed, which then require further measurement. Understandably, the company desperately needed a multi-use piece of measuring equipment; to fully maximise machine efficiencies. Particularly intricate components manufactured by voestalpine Rotec Ltd may have over 20 individual holes and slots, which could take operators a considerable amount of time to measure. In addition of line processes such as layout inspection it is incredibly time consuming. Quality Engineers typically recorded measurements manually, which involved writing down several measurements and then typing it all up later, this all added to the possibilities of human error. Bowers Group also supplied voestalpine Rotec Ltd with blue tooth equipped hand tools; the Sylvac S_Mic Pro Blue Tooth Micrometer set (0 -102mm) and the Sylvac S_Cal Digital Calipers (200mm) to fulfil their other measurement needs.